A snapshot of where menswear is at today. Think of Carlos Campos’s spring collection as a more refined take on football fanwear. This collection was a big valentine to soccer and everyone that loves it, down to the players, referees, and fans. Carlos Campos’s presentation on Sunday evening at Milk Studios made quite the definitive silhouette statement; for Campos, “lean and mean” is the way to go for Fall 2013, and he offered a plethora of ways to do so. In a childhood that encompassed the entire nineteen-eighties and a great deal of the nineties, I somehow never managed to see Newsies. And thanks to Carlos Campos, now I never have to (if the long-rumored Broadway musical version of Newsies ever gets going, I know which designer they should consult for costumes). 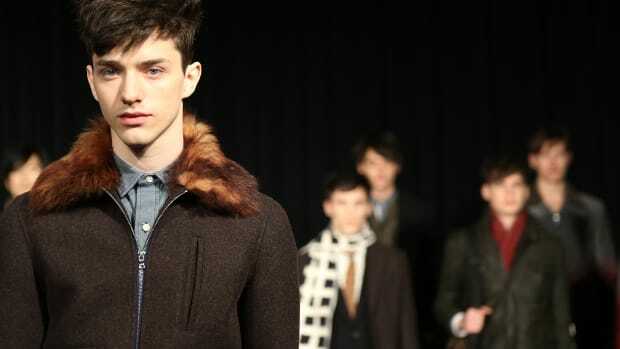 Campos’s F/W 2011 inspiration reached back into his Latin American roots, seizing on the works of Pablo Neruda. The 1930’s urban look, gave us newsboy caps, leather bombers, pullovers, and militaristic nuances. Campos’s ode to common things included a mostly muted, earthy palette, “as if it’s been burnt or left to age,” says campos. This let the eye focus on his fine Italian wools and cottons, as well as the old-world tender loving care the designer brings to each piece.